Purified Water, Sodium Lauryl Glucose Carboxylate, Lauryl Glucoside, Coco Betaine, Coco Glucoside, Glyceryl Oleate, Sodium Citrate, Phenoxyethanol, Caprylyl Glycol, Sorbic Acid, Sodium Chloride. Non-drying, moisturizing, aides in the treatment of acne. Contains botanical ingredients. 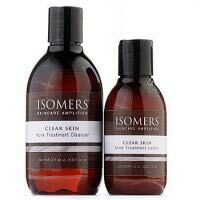 Can make skin feel oily, iF too much is applied to skin, Part of an Acne Treatment line which has helped my skin very much. Did not cause drtness or irritation. Anti-inflammatory ingredients.